Italian goldsmith, sculptor and painter, born at Florence. He was the son of Michele di Francesco de Cioni, and took his name from his master, the goldsmith Giuliano Verrocchi. Except through his works, little is known of his life. As a painter he occupies an important position from the fact that Leonardo Da Vinci and Lorenzo di Credi worked for many years in his bottéga as pupils and assistants. Only one existing painting can be attributed with absolute certainty to Verrocchio's hand, the celebrated "Baptism of Christ", originally painted for the monks of Vallombrosa, and now in the academy of Florence. The figures of Christ and the Baptist are executed with great vigor and refinement of touch, but are rather hard and angular in style. The two angels are of a much more graceful cast; the face of one is of especial beauty, and Giorgio Vasari is probably right in saying that this head was painted by the young Leonardo. Other pictures from Verrocchio's bottéga probably exist, as, for example, two in the National Gallery of London formerly attributed to Antonio del Pollaiuolo -- "Tobias and the Angel" (No. 781) and the very lovely "Madonna and Angels" (No. 296), both very brilliant and jewel-like in color. This exquisite painting may possibly have been painted from Verrocchio's design by Lorenzo di Credi while he was under the immediate influence of his wonderful fellow-pupil, Da Vinci. In examining Verrocchio's work as a sculptor we are on surer ground. One of his earliest works was the beautiful marble medallion of the Madonna, over the tomb of Leonardo Bruni of Arezzo in the church of Santa Croce at Florence. In 1472 Verrocchio completed the fine tomb of Giovanni and Piero de Medici, between the sacristy and the lady chapel of San Lorenzo at Florence. This consists of a great porphyry sarcophagus enriched with magnificent acanthus foliage in bronze. Above it is a graceful open bronze grill, made like a network of cordage. In 1474 Verrocchio began the monument to Cardinal Forteguerra at the west end of Pistoia cathedral. The kneeling figure of the cardinal was never completed, and now lies in a room of La Sapienza, but the whole design is shown in what is probably Verrocchio's original clay sketch, now in the South Kensington Museum. Though this work was designed by Verrocchio, the actual execution of it was entrusted to his assistant, the Florentine Lorenzetto. In 1476 Verrocchio modelled and cast the fine but too realistic bronze statue of David, now in the Bargello (Florence); and in the following year he completed one of the reliefs of the magnificent silver altar-frontal of the Florentine baptistery, that representing the "Beheading of St. John." Verrocchio's other works in the precious metals are now lost, but Vasari records that he made many elaborate pieces of plate and jewelry, such as morses for copes, as well as a series of silver statues of the Apostles for the pope's chapel in the Vatican. Between 1478 and 1483 he was occupied in making the bronze group of the "Unbelief of St. Thomas", which still stands in one of the external niches of Or San Michele (Florence). He received 800 florins for these two figures, which are more remarkable for the excellence of their technique than for their sculpturesque beauty. The attitudes are rather rigid and the faces hard in expression. Verrocchio's chief masterpiece was the colossal bronze equestrian statue of the Venetian general Bartolommeo Colleoni, which stands in thepiazza of SS. Giovanni e Paolo at Venice. Verrocchio received the order for this statue in 1479, but had only completed the model when he died in 1488. In spite of his request that the casting should be entrusted to his pupil Lorenzo di Credi, the work was given to Alessandro Leopardi by the Venetian senate, and the statue was gilt and unveiled in 1496. There appears to be no doubt that the model was completed by Verrocchio himself, and that nothing more than its reproduction in bronze should be attributed to the much feebler hand of Leopardi, who, however, has set his own name alone on the belly-band of the horse: ALEXANDER LEOPARDVS V. F. OPUS. This is perhaps the noblest equestrian statue in the world, being in some respects superior to the antique bronze of Marcus Aurelius in Rome and to that of Gattamelata at Padua by Donatello. The horse is designed with wonderful nobility and spirit, and the easy pose of the great general, combining perfect balance with absolute ease and security in the saddle, is a marvel of sculpturesque ability. Most remarkable skill is shown by the way in which Verrocchio has exaggerated the strongly marked features of the general, so that nothing of its powerful effect is lost by the lofty position of the head. According to Vasari, Verrocchio was one of the first sculptors who made a practical use of casts from living and dead subjects. He is said also to have produced plastic works in terra-cotta, wood and in wax decorated with color. As a sculptor his chief pupil was Francesco di Simone, the son of that Simone whom Vasari wrongly calls a brother of Donatello. 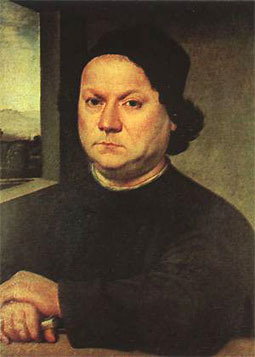 Another pupil was Agnolo di Polo (Paolo), who worked chiefly in terra-cotta. Verrocchio died in Venice in 1488, and was buried in the church of St. Ambrogio in Florence.